Moving is an essential variable in everybody’s lives. Whether it’s to a new location closer to work or a certain part of your home—that’s just the right size for that party you’ve wanted to have — portable air conditioners can fit into everyone’s lifestyles. Keeping your environment cool and comfortable has never been easier and, thanks to portable air units, we can ensure that it always is. If you’re shopping for a portable air conditioner, we’d recommend you start by looking at units made from these four brands. Founded and headquartered in Austin, Texas, Koldfront follows their mission statement of providing customers with high-quality, stylish and affordable portable air conditioners, enriching and simplifying their lives along with the places they spend most time. With the Cajun word “lagniappe,” meaning give a little extra, held close to their hearts, the quality of products and service provided for their costumers is internationally known. Their intuitive design helps make our lives less worrisome, allowing us to spend more of our time doing what matters. Ranging from 8,000 BTUs to 14,000 BTUs of cooling power, Koldfront’s portable air units are built to be compatible with almost any scenario, fitting into our lives almost seamlessly. Koldfront’s user-friendly design allows for a quick and easy installation, wherever and whenever. A window kits comes included with the portable air conditioners, allowing the appliance to take up less space than a window A/C unit. This allows you to fully enjoy your view and soak up some rays without any worry of obstruction. The unit is also easy to remove and relocate, or store when not in use, so you can be sure to utilize all the benefits with the appliance. The energy-efficient programmable timer allows for Koldfront’s portable air conditioning units to operate at your desired times, which gives optimal control over your climate. With ease, the timer can be programmed to turn the appliance off right after you leave for work and switch on right before you get home, so you can be sure to come home to a cool and comfortable climate. Worried about what would happen in the case of a power failure? Don’t be. Koldfront’s intelligent automatic restart function will store the unit’s current settings, picking up right where it left off when the power comes back on. With a dehumidifying mode, the unit will circulate the air and accumulate the water in the reservoir. And, with a self-evaporative automatic drain system, these portable air conditioners are able to expel liquids formed by condensation, so you don’t have to worry about manually draining the unit (in most climates). Founded in 1999, by Rich Lundbom, and headquartered in Austin, the company has specialized in creating appliances that enhance our everyday lives, while consistently revolutionizing the industry. EdgeStar’s powerful and energy conscious design enables for your home to remain cool and help you save money. Ranging from 10,000 BTUs to 16,000 BTU’s of cooling power, EdgeStar has some of the highest cooling capacity portable A/C units on the market for residential uses. So, instead of adjusting your thermostat to keep the warmest parts of your home cool, these portable air conditioners can be an efficient way to keep rooms at your desired temperature without sacrificing your electricity bill. In the event of a power failure or if the appliance were shutdown improperly, EdgeStar’s automatic restart function will restore the previously selected settings and cool your home as if nothing had happened. This helps take excess worry from your life and allows you to relax that much easier. One of EdgeStar’s great features is its environmentally savvy design. While the unit operates in auto mode, the air conditioner will automatically analyze the surrounding environment and adjust its function in response to the ambient temperature. This allows the air conditioner to do all of the work for you, giving one less thing you need to worry about. For locations where window air units are not allowed, portable A/Cs are a perfect alternative. With no intrusion from the outside, this allows the units to comply with building codes and overzealous home owner associations. With half a century of appliance experience under their belt, Avallon focuses to engineer affordable appliances which make the lives of their customers easier. They believe that luxury, convenience and innovation should be appliance necessities, not additional features. Aside from their focus to achieve consumer convenience, Avallon values the quality of their products. A lot of thought and technical detail goes into the selection of their appliances and features, putting customer satisfaction and product value at the forefront of Avallon’s mind. Avallon features powerful units, ranging from 10,000 BTUs to 14,000 BTUs of cooling powered portable air conditioners. The built-in self-evaporating technology, also known as InvisiMist, ensures the uninterrupted removal of moisture for your home. When excess water builds up in the appliance’s reservoir, the InvisiMist function will automatically activate and expel the water through the vent hose as a light mist. Their dual-hose design for portable air conditioning units cools about 40 percent faster than similar single-hosed units, which allows you to achieve optimal comfort at a quick rate. Because of these mechanics, no air pressure is lost and remains stabilized. The indoor air is cooled and ventilated, while the second hose allows for outdoor air to be brought in to cool the appliance. 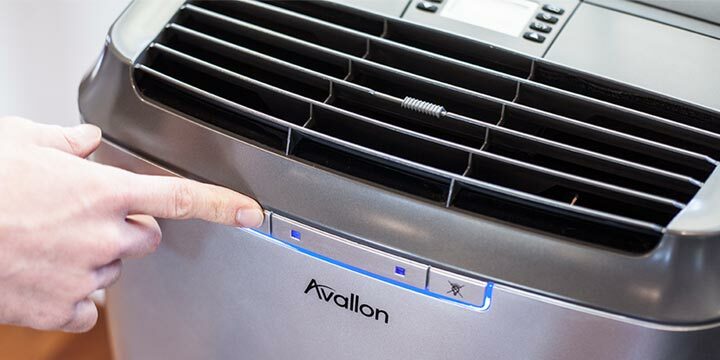 Avallon’s portable A/C units also feature an intelligent auto-cooling mode, by which the appliance operates depending on the ambient temperature of the room it is placed. As the environment’s climate changes around the unit, it will operate accordingly and change modes and fan speeds to adjust to your desired temperature. While the company is headquartered in West Lake Hills, Texas, they strive to partner with leading retailers throughout the country to ensure that all consumers are able to take advantage of their value for features that stand out in lifestyle appliances. While LG was founded in South Korea, in 1958, the company has become one of the leading appliance manufacturers in the world. Their mission is to create happier, and better, lives for their customers. LG values the philosophy “Great Company, Great People,” holding strong that it takes a great group of people to maintain and operate a great company. The technologically savvy company has set standards for a variety of appliances, and their portable air conditioners are powerful, smart and easy to use. LG’s cooling units are designed with a number of smart features, including auto restart, 24-hour On/Off timer, and many more, to help the device operate effectively and smoothly. The portable air conditioner and dehumidifying units come equipped with a washable air filter, which makes user maintenance and upkeep a breeze. The filter can be easily cleaned with a vacuum, and for heavily soiled filters—it can be easily washed in warm water with a mild detergent. LG’s units come with 24-hour programmable timers, so you can decide which times of the day you way the appliance to run. In the event of a power failure, the portable cooling units will reestablish the previous settings and make sure that the climate returns to your desired temperature. The devices are also programmed to adjust the louvered air discharge openings depending on the operational state. When the unit is off, the Louvers will close to prevent any debris from entering. While the device is on, the louvers can be set to oscillate and distribute air more evenly through the room. Also, thanks to the infrared remote control, most of the portable air conditioner’s features can be easily operated from across the room. Because of portable air conditioners, keeping your environment consistently comfortable is easier than many think. And, thanks to these four popular brands, affordable, intuitive and simplistic solutions to your heating nightmares are just a click away.